The NPD’s estimate for total proven and unproven petroleum resources is about 15.6 billion standard cubic metres of oil equivalents. 53% of these are remaining. The Norwegian Petroleum Directorate (NPD) estimates that the total proven and unproven petroleum resources on the Norwegian Continental Shelf is about 15.6 billion standard cubic metres of oil equivalents at 31st of December 2018. This is 24 million more than at the end of 2017. Of this volume,7.3 billion Sm3 o.e. or 47% has been sold and delivered. The rest, equaling 8.3 billion Sm3 o.e. still has to be produced but parts of these remaining resources have not been proven yet. The unproven resources account for 3.9 billion Sm3 o.e. This has been reduced by the added growth of resources from new discoveries in 2018, approx. 60 million Sm3 o.e. The 4.4 billion Sm3 o.e. proven resources are divided into reserves and contingent resources. Reserves, from projects with an approved PDO, amounted to 2996 million Sm3 o.e.at the end of 2018. 54% of this is gas. Contingent resources are proven oil and gas which is not yet decided to be produced. Petroleum volumes in potential improved recovery projects are included in this category. At year-end, contingent resources amounted to 1367 million Sm3 o.e. Non-commercial resources are not included. Resources in discoveries have increased by 60 million Sm3 o.e., to 660 million Sm3 o.e. This increase can be attributed to resource growth from seven new discoveries in 2018 (read also “500mmboe in 2018”) . In addition, eight discoveries where development was previously deemed to be unlikely have now been considered for development. However, reduced resource estimates in discoveries and submission of the PDO for Nova resulted in the increase not being larger than 60 million Sm3 o.e. 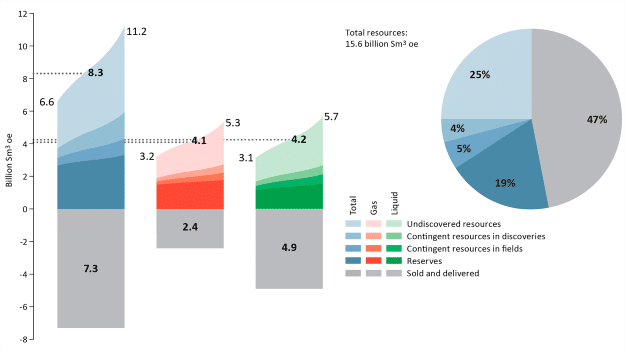 Contingent resources in fields amount to 708 million Sm3 o.e., or 16% of the remaining proven resources. In 2018, contingent resources in fields were reduced by 114 million Sm3 o.e. compared with the 2017 accounts. The reduction can mainly be explained by the development phase two for the Johan Sverdrup field. 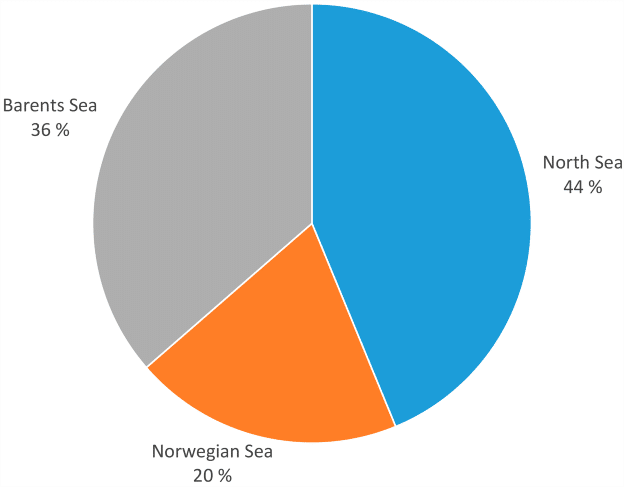 When looking at resources per area the NPD states that the North Sea contains about 44% of the remaining resources, 37% remain in the Barents Sea and 19% in the Norwegian Sea. A large percentage of the expected remaining resources in the Barents Sea have not yet been proven. Read the full article from the NPD here.